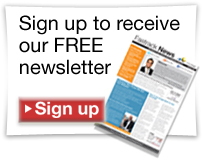 this afternoon I worked on a review of a new forex pair: NZD/USD. 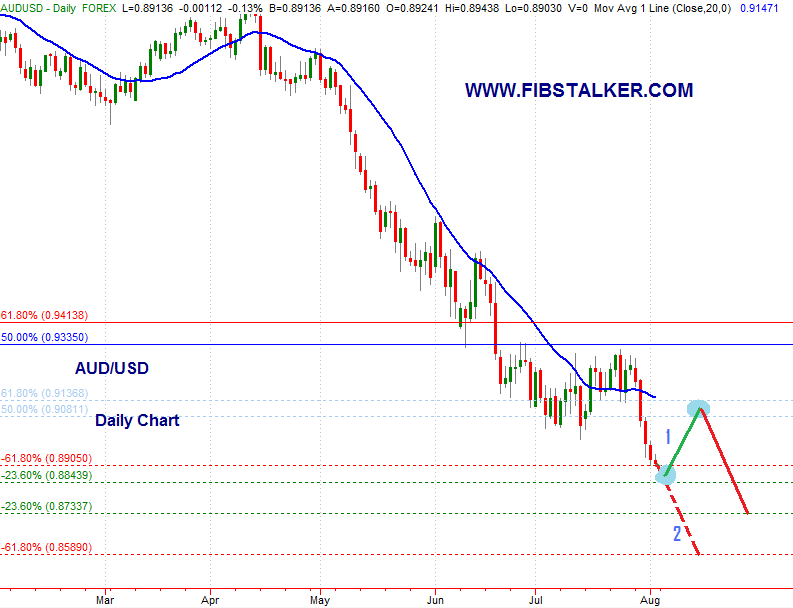 I weekly analyze the AUD/USD (see below) and a subscriber asked me to analyze the New Zealand Dollar versus the US Dollar. Please find the video hereunder. 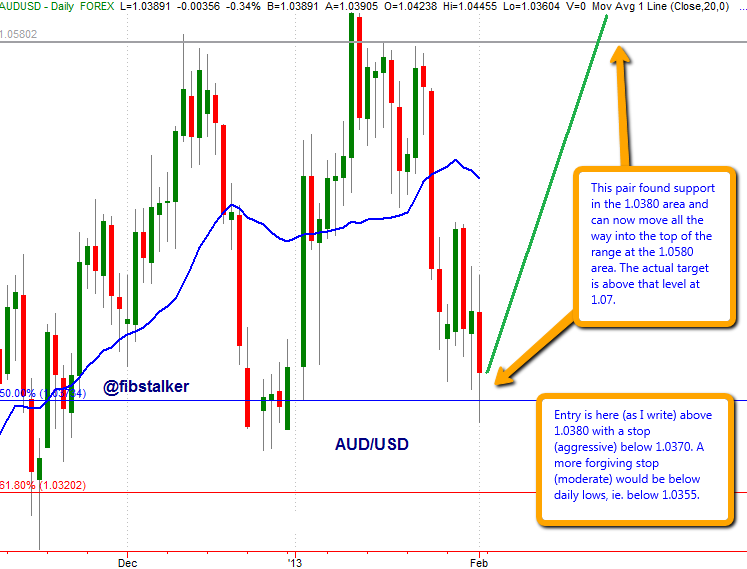 I regularly feature the AUD/USD pair in my weekly FibStalker View on Currencies (see an example here) I share with my Newsletter subscribers. The weekly chart shows a sloppy support in the 0.7430 – 0.77 area that did not hold at the end of 2011 but was defended in May 2012 (the same trace on the AUD/USD is neat, to further testimony of the higher volume of that pair). This area of support has a long-term target 0.9370 and we could get there if Dollar weakness is confirmed by the FED in the coming weeks. 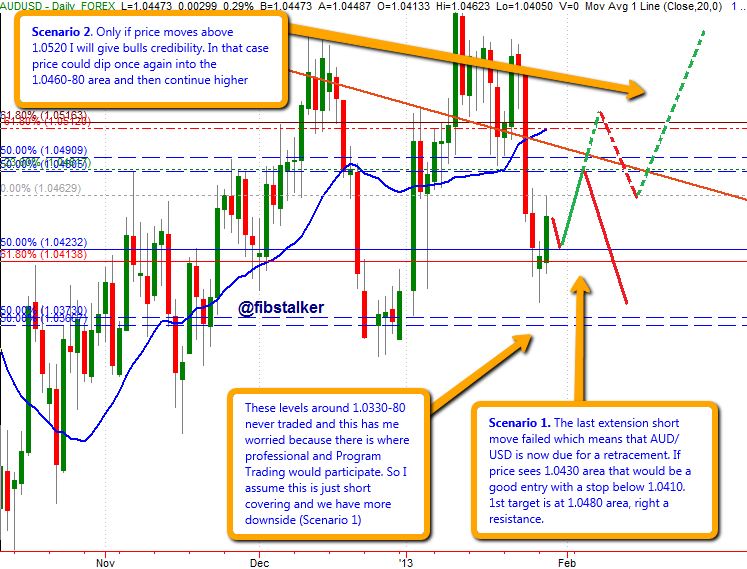 On the daily chart the NZD/USD pair is moving in extensions. The last long setup is in the 0.7940 area and hit first target in the 0.8350 area already. The second target is above at 0.8570 and there is where price is headed. There is an inner support level at 0.8080 with a first target at 0.8470 helping price into the 0.85s. On the daily the last long setup was an extension showing support at 0.8190, first target at 0.83 (already hit) and a second target into previous highs at 0.8350. If price keeps trading in extension longs in the daily chart the next level of support where adding to longs would be 0.8320 with a stop below 0.83, for a continuation higher.